The most frequent word that crops up in the reviews of Chris’s speaking events is ‘inspirational’. He questioned everything to do with how he works to live life to the full. 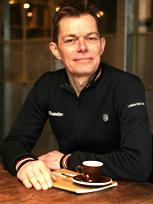 From founding and selling companies for multi-millions to cycling the whole of the 100th Le Tour de France route, he provides a very personal, honest engagement and inspiration for people who want to live life to the full. Chris is the “boss that works from coffee shops” (BBC) His ‘Out Of Office’ book having already been No. 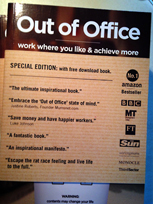 1 in the UK and Germany and top 20 in the USA and Canada, His ‘Out Of Office’ framework, has been championed by the likes of BBC, Management Today, the FT and The Sun and arms audiences with the tools to maximise their productivity, creativity, sales and chances of success wherever and whenever they are working AND more free time do the things they’ve always wanted to. His talks show individuals how to question how they think about ‘work', how they do their ‘work' and what they could really achieve in life if they change some of their bad habits. He equips readers and audiences with confidence, knowledge to escape the trappings of success and the motivation to want to do more than just ‘work’. He shows how to be a business manager in this new landscape, through the productivity and not the presence of the staff, and how to motivate, inspire and energise a workforce that are answering emails at all times of the day. 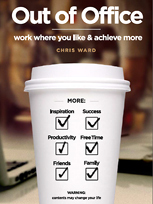 For organisations, Chris shows how everyone can achieve literally 50% more productivity and creativity. Getting flexible / remote working right saves companies time and money while increasing the overall happiness of employees. In 2014 Chris was named one of the top 7 most powerful part-time working men in the UK - which meant he also had the time to become the oldest Britain to conquer the ‘Bicinglette Challenge’ - cycling up and down Mount Ventoux 6 times within a day - equivalent to cycling higher than Mount Everest. Chris writes regulary for the Huffington Past and Randi Zuckerburg’s Dotcomplicated in the US. Chris is an engaging world-class speaker. His passion, commitment and energy enable him to inform and stimulate audiences of all levels. 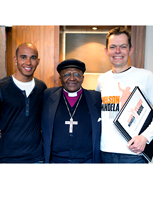 He connects with them on an emotional level and brings to life the determination to change lives. He sparks audiences with a ‘can do’ attitude and the questions they need to answer to ‘make it happen’ for themselves. He makes people think, question their lives and inspires them to act. Chris has spoken on some of the most important platforms and summits, ranging from on board the Orianna for the Marketing Forum, alongside Julian Assange at The Personal Democracy Forum in Barcelona, alongside Queen Rania of Jordan at the GSMA Mobile World Congress and for Brent Hoberman’s Founders Forum event in London. His audiences have included the likes of Jack Dorsey, founder of Twitter, The South African Government, Tessa Jowell MP and Stuart Rose ex CEO OF M&S. He can interact with a wide range of people and delivers keynote speeches for corporates, after dinner speaking and to university classrooms, tailoring his speeches to suit the needs of the audience. In the book, and in Chris’s talks and courses, we also learn about how the biggest names and smartest thinkers changed the way they work and the world around them. In great coffee shops, Harry Potter and Moshi Monsters were born, Obama’s first presidential speech was composed, and many websites such as craigslist and Foursquare.com were built. "It was a huge pleasure to have Chris talk. He really set people thinking very hard about their lifestyle and priorities and the books were eagerly snapped up."